First of all, I broke my toe yesterday. It hurts but not nearly as much as the broken/crushed fingertip of 2012. I accidentally bumped it into the door jamb on my way to the laundry room. I saw an orthopedic doctor today and he thinks it should heal up without surgery (whew). So I'm keeping it taped to its neighbor, wearing an ugly hard uncomfortable velcro shoe, and thinking healing thoughts. Some other stuff happened this week--we went to the EMP Museum on Monday and saw lots of cool stuff like stakes from Buffy the Vampire Slayer and a Dalek and Star Trek paraphernalia and lots of clothing of Women Who Rock (my daughter LOVED the frothy pink Loretta Lynn gown). A replica of a meat dress, even. Oh yeah, and Princess Bride stuff! It was pretty amazing. Buttercup's wedding gown is beautiful. Then school started on Wednesday, for my boys. Here's hoping for a very good school year for them both. Last weekend I went to a Seattle MQG sew-in; it was pretty fun. 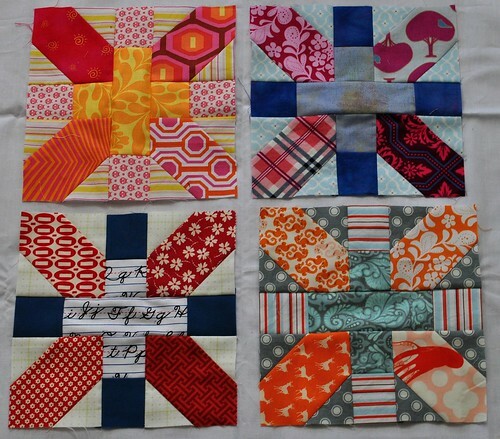 I finished up 4 x-plus blocks, one scrappy trip block, and started some selvage Christmas ornaments. I had a good time visiting with friends too, it is so good to get to know people a little better and there are some way cool people in that group. 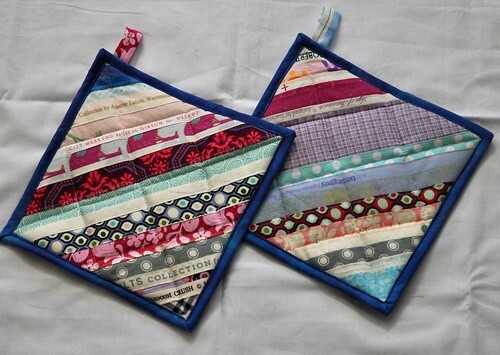 Unswapped berry-colored selvage potholders--I made these for the September Seattle MQG meeting but it was on the first day of school, which was the night before the first early middle school day, and I felt like I needed to stay home and do bedtime with my kids. We're trying hard to get really solidly into our routine and I think it will help a lot. So I didn't swap my potholders. Maybe there will be some others that still need to swap next time. Or maybe I'll just keep them. I like them. And a secret project that I'm not all the way sure about doing yet. I'm also finally watching the most recent season of Dr. Who and rereading The Graveyard Book. What are your plans for the month? HI! 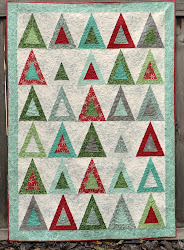 I was just wondering...when you do all these blocks like the above with so many different colors/prints/scraps...I can see how you choose what colors to match, but..how do you arrange/organize cutting all the pieces? 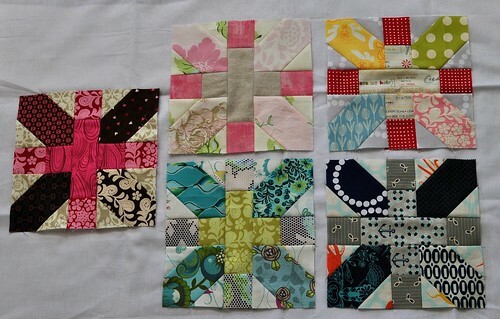 I am thinking when I do a quilt I always have the blocks matching so I can cut 2-3 of each piece at a time from the nicely folded fabric! But...in this case...it seems you have to literally cut each piece separately. or maybe layer a few scraps...care to share how you organize this feat?! I am not so sure it wouldn't drive me nutty organizing all those colors and pieces and scraps! You do such good work! You X+ blocks are awesome. I love your fabrics and colors. And your hot pads are cute too. I wouldn't blame you if you kept them. Also, sorry about your toe! That is no fun. I hope you heal quickly and without surgery.